My thoughts are....... that it was just okay. We will not be taking the kids to see it at the theater. First and foremost, I think they would be bored. The beginning is very slow to get going and the plot would kind of be over their heads I think with her being rebellious about corsets and stockings, and then attending a party that turns out to be her engagement party. That doesn't ruin the plot I don't think. She eventually chases after the white rabbit and falls in the rabbit hole...etc., etc. It was very much like the movies I have seen before..just different looking. The plot is a little different but several of the same things happen, but with less "childishness" about them. My conclusion is that...it wasn't serious and deep enough to make it interesting enough for adults, but it wasn't childish and silly enough to make it fully appropriate for children either. The gruesome aspects (stepping on human heads to cross a moat, monster eyes being plucked out by straight pins) make it just too much for little kids, so then the lack of more makes it slightly too simple for adults. I think it should have gone one more step one way or the other. It does look very interesting and beautiful. The 3D affects are great. There are some really funny parts with the Red Queen when she goes on her tirades, but I don't think kids would "get it." The March Hare is pretty funny. The Mad Hatter is typical of what you would expect with Johnny Depp playing that part. The White Queen is whimsical. There is a good message of good conquering evil and the Red Queen's demise. I even picked up on some easy to make comparisons between the overall story/characters/storyline and Christianity. Overall...if I were rating on a scale of 1-10 with 1 being Mystery Science Theater level and 10 being like Epic Life Changing Films...I would give it a ....... 6. I would watch it again maybe, the story is good because the story was already good, but it will be hard to find the just right age for our kids so we can watch it together as a family. Better versions of this movie have already been made, in my opinion the Disney one is the best because it makes me laugh a lot! Even though they said it is not supposed to be "the original movie" it kind of is. A good version, but disappointed because it could have been so much better. I think the fault lies with whoever wrote the screenplay. I agree with most everything written in this review, although I think their take on the "sexual content" wasn't as bad as it sounded. The wardrobe issues weren't issues at all for me nor would it be for my kids. Any innuendo was extremely disguised and rare. The only really odd thing was with the people who all had exaggerated features to fit in with the queen's big head...there is the lady like it says in the review....which was just kind of trashy looking, for older boys it could be more inappropriate though the glimpses of that particular lady are just two very fast glances. The main part that strikes it out for me is the "Violent Content" it reviews in detail. It is definitely all as described if not more. I saw it this weekend and when it was over, I was a little confused, like I didn't really know what to think of it other than it was just 'okay'. The effects were pretty cool. I think the cast was well-chosen. I think Alan Rickman's (Professor Snape! :)) voice was perfect for the caterpillar and Helena Bonham Carter was perfect for the Red Queen. There were definitely some slow moments and I agree with you that they should have taken it a step further in either direction. 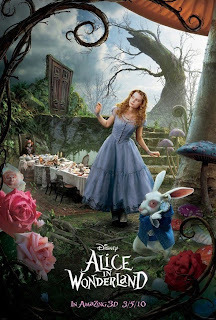 "Curiouser and curiouser," says Alice in Tim Burton's latest, and for the first time I don't believe her !!! I liked it. If Burton signed on to do a version of The Hunting of the Snark, I'd be ecstatic. I saw it in 3D but it probably isn't necessary to enjoy it. I wish I had seen Avatar in 3D, though.